Maisie Dobbs by Jacqueline Winspear is a ten-year-old novel now, and I've only just read it for the first time. At the end of this month, the twelfth book of the series will be released and I will be reading it as well. It took me a little while to get into the story and style of writing. The book starts in 1929, then goes back in time to share Maisie's background, then back to 1929. I think I would have preferred to read her background first, but I understand why Winspear chose to write it in this order. Once I got to know Maisie a bit, I really enjoyed her. Maisie is a unique character, a strong, intelligent woman of humble beginnings who is given a great opportunity to rise above her station in life. I enjoyed the way she thought things through and used her conversations with others to work things out. The other characters are secondary to Maisie, but integral to who she is and how she embraces life. She may be independent, but she also relies on those around her for counsel and support. 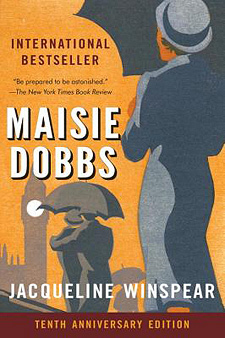 If you're looking for an early 20th century mystery that stars an endearing sleuth, I highly recommend Maisie Dobbs. This review was written based on a copy of Maisie Dobbs that I received from TLC Book Tours in exchange for an honest review. This post includes Amazon Affiliate links. If you purchase something using my link, I will receive a very small commission but your price does not change. Glad you enjoyed this book. I certainly did. I like how it was substantial on its own without any bloody scenes or shockers. I really need to catch up on the later books in Maisie Dobbs series - she is quite a character.